When you try to change the Regional Settings using Group Policy you find that the change you make is not saved and reverts to the original setting each time. 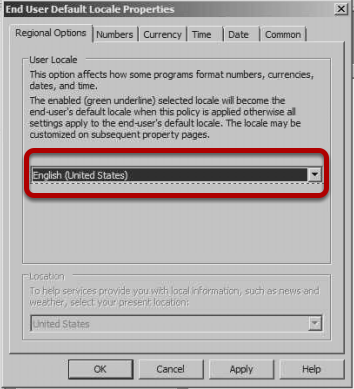 In the Regional Options section of the Group Policy Preferences you will see the language setting is underlined in red. This means the setting will apply as the default for all users. If you change this and look at the setting again it will revert tot he default. The reason is that Microsoft aquired this application and left a hidden feature in, you have to use the Function keys to change the settings. F5 - Mark all settings to apply all "green"
F6 - Mark setting as apply "green"
F7 - Mark setting as don't apply "red"
F8 - Mark all settings to don't apply "red"
This is a really simple thing but you will never find the setting unless you RTFM and lets face it, we are a bit lazy at that.